Warmer weather and longer days have started to brighten lives here in the Seattle area. People have more spring in their steps, we've been getting free pizza nonstop, and everyone just seems happier. Life is good. Scientists could attribute this to us receiving more sunlight, but I'm inclined to believe this all comes from positive Halo vibes. Rather than just talk about life being good though, let's jump into this Community Update and see exactly why that is! There's no way I'm going to get in between you, ske7ch, and MCC news in this current climate, so I'll toss the next bit of the blog on over to him now. Thanks Uny! A lot’s happened since our last Community Update. I’m sure you’ve no doubt heard by now, but on Tuesday, March 12 we shared the exciting news that Halo: Reach is coming to MCC and the entire collection is heading to PC via the Windows Store and Steam! This news came via an appearance on Inside Xbox – you can catch that segment, along with me joyfully eating pizza, right HERE. If you did miss the full announcement, be sure to read the official blog and get the full details right HERE. And if for some reason you don't understand the pizza references, you can get caught up HERE. We also jumped on to the /r/gaming subreddit to host an AMA about the announcement. To catch a concise summary of all the questions and answers, look no further than right HERE. Adding Halo: Reach to MCC and bringing the whole collection to PC in the right way is by no means a trivial undertaking. To help make these games the best they can be, we’re enlisting the help of all of YOU! The Halo Insider program is the new way for the community to partner with us to help shape and improve our games and products. Public “flighting” – playtests of in-development game builds – will be a huge part of the development roadmap for MCC and Halo Insiders will be the group called upon to join us on this journey. We’re now taking applications for flighting participants for both Halo: Reach on Xbox One and MCC on Steam flighting. 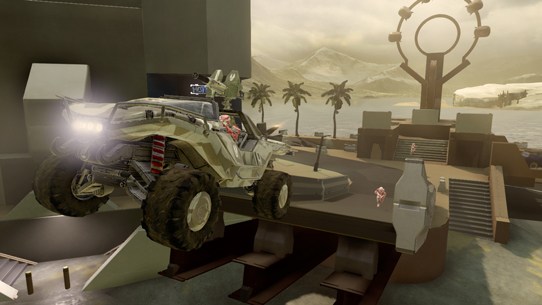 Please head over to the Halo Insider hub and join today! If you’ve got questions about Halo Insider, please be sure to check out our newly launched Halo Insider forum and this handy dandy FAQ! Thanks again, Uny. Back on over to you! 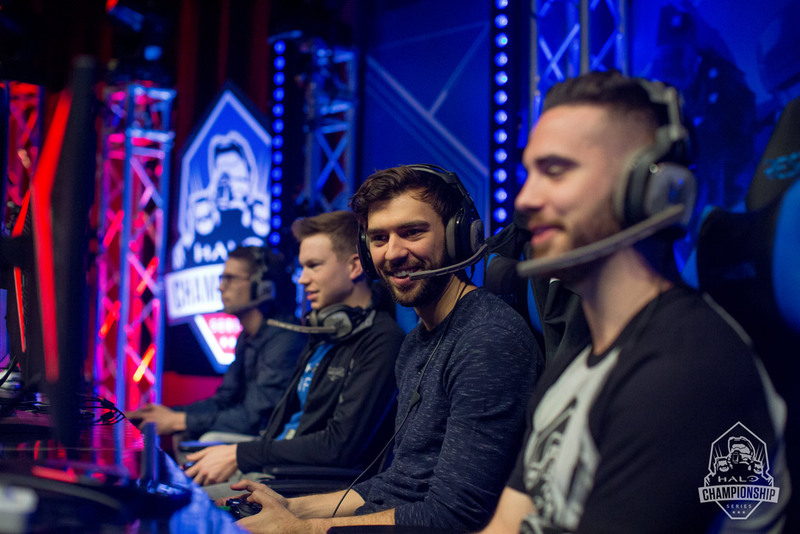 The HCS Team is right in the middle of back-to-back events. Last weekend's event brought us down to Texas for the HCS Invitational at SXSW and this weekend's Gamers For Giving event will take us over to Michigan. Since this section might get a little heavy, let's dive right in! Bringing Halo to SXSW was no easy feat, but the team brought it together and made it something truly special. Whether it was the $5,000 Free For All for attendees, a ProAm featuring players from Microsoft Stores around the country, a Big Team Battle Bonanza between Walshy and Goldenboy, HCS Grassroots Content Creators Streaming from the showfloor, a counseling session before the Snip3down and Lethul Rivals match, or the $100,000 Invitational, we made sure to fit as many good times into one weekend as possible. We hope this myriad of activities helped keep you entertained throughout the weekend, because I know I enjoyed it! 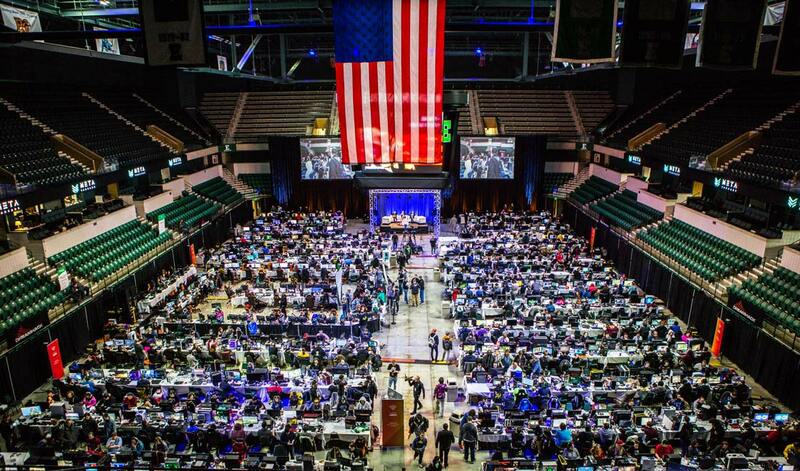 This weekend, Halo will be part of one of the biggest LANs in North America – Gamers For Giving. The team at Gamers Outreach have been running Halo tournaments since their inception, so we knew we had to lend our support for the event as well as their amazing charitable efforts. We'll be providing a helping hand via the HCS Grassroots program to assist with prize pool, promotion, content, and a Gamers Outreach GO Kart. To ensure you don't miss a moment of the charitable event or our HCS Grassroots tournament, keep an eye on the GamersOutreach Twitch & Twitter accounts! Our next Microsoft Store 2v2 Tournament is happening next Sunday, March 31! As always, you can get all the information and details possible about your local Microsoft Store at aka.ms/MCCHalo. To help you plan your next trips to the MS Store with your duo, be sure to mark the dates of these events in your calendar! You'll also be able to catch a cross-store competition hosted on our Mixer channel each Sunday at 12pm PT. 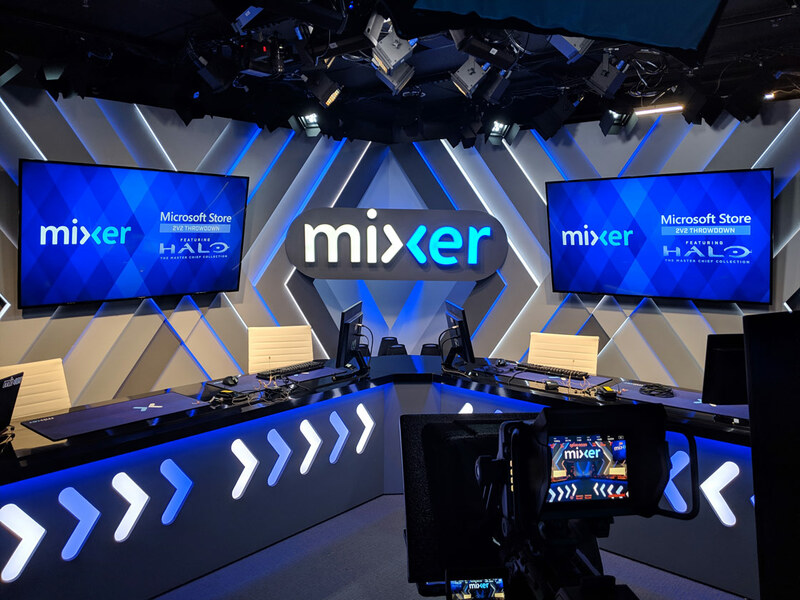 Tashi and I will be hosting the shindig live from Mixer's Studio One, interviewing people in Microsoft Stores, and enjoying some fun-spirited competitive Halo action. We hope you tune in and join us! While our Halo 5 activity isn't quite at "MCC on PC!" levels, we wanted to give you a quick look at what the rest of the month is looking like as well as give you another glimpse at our Big Team Battle progress. 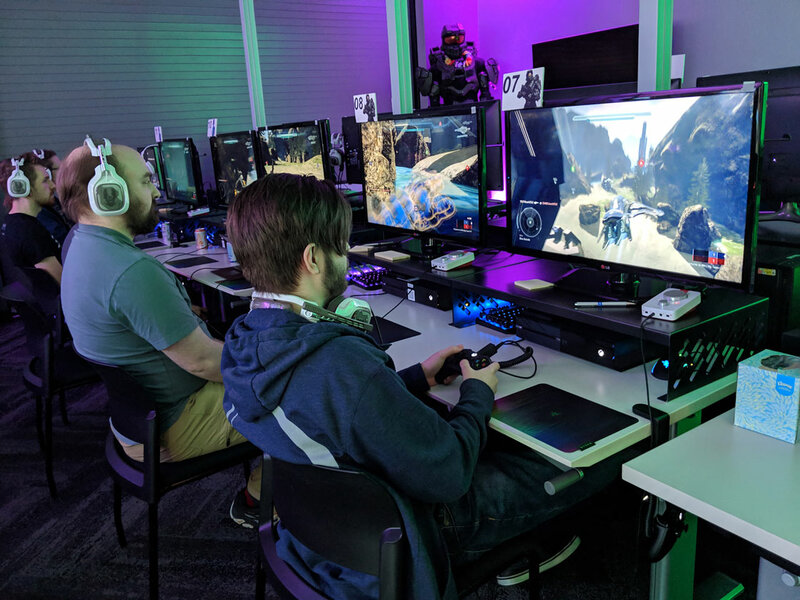 I happened to wander into our Playtest Lab downstairs while the Halo 5 Sustain Team was testing out some new maps and refreshed maps the other day. The serendipitous nature of this encounter meant I had to take a picture. Here's a tease at what the refreshed version of Viking may look like when it hits the playlist. 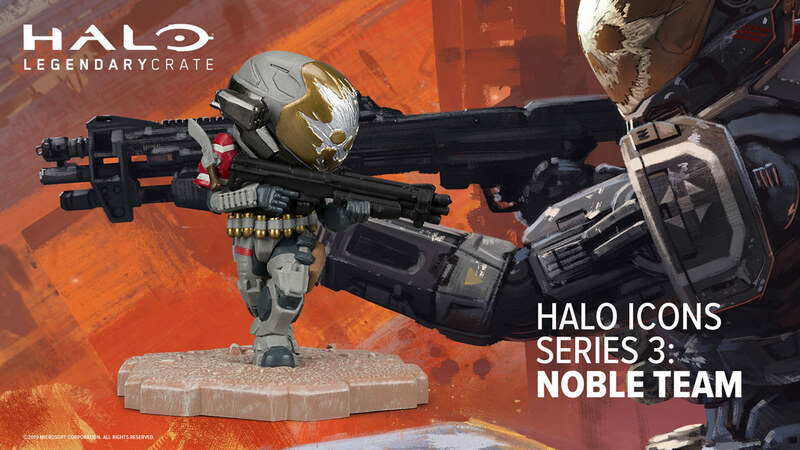 This week's Halo Gear section has a double-dose of dominant forces! 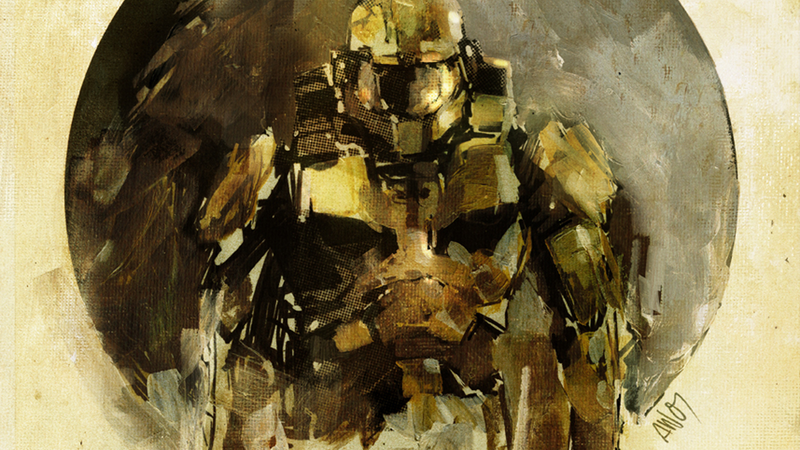 Emile, who has the best quote in Halo: Reach, and the UNSC Infinity, which is practically unstoppable, are both getting some love this time around. It's going to be a tough choice, but I'll let you decide which one you like more. Striking fear into all he encountered, Emile fearlessly cut through enemy forces and instilled hope in an entire race. He is honored as the merciless wrath of the legendary Noble Team. Earlier this week we got the first glimpse at what his Halo Icons figure would look like including his signature skull-scratched helmet. If you like what you see, be sure to order your crate before 9pm PT on April 15! All I can say is, "I'm ready, how 'bout you?" 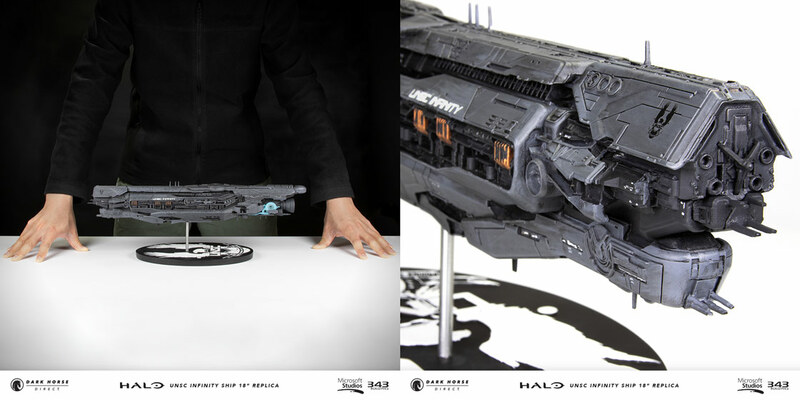 There are only 500 of these 18" UNSC Infinity replicas out in the wild. While it has to be more manageable than a lifesize recreation, the Community Team is still in shock at the scale of this one. This beacon of hope for the UNSC looks so good in-person that one might just show up on the mantle above my fireplace. 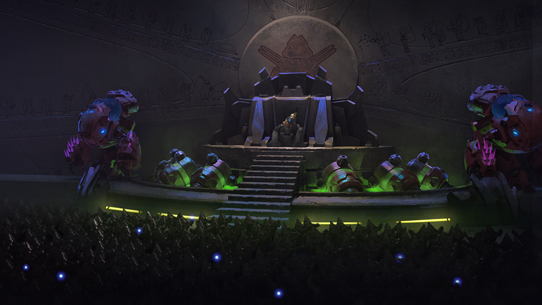 To protect Earth and her colonies, visit direct.darkhorse.com and secure one of your own today! It seems like you all are always up to something. Whether it's bombarding us with pizza or hosting your own tournaments for the love of the game, there's always so many cool community beats to track. Here are a few that I definitely wanted to call out in this week's Community Update! One of our Moderators across various platforms, FootedPanda, is a Staff Sergeant in the US Army and has been helping lead the creation of a Halo team under the U.S. Army Esports umbrella. Here are a few words from him about the team and how to get involved! As part of its continual effort to reach out to new communities and speak to the next generation of soldiers, the U.S. Army Esports Team looks forward to becoming a fixture of the Halo community and competitive scene. Membership is open to any currently serving Active Duty or Reserves soldiers. Team leadership plans to have regular weekend meetups in order to scrimmage against each other to determine a final roster. If interested, please contact Team Leader Sweet Dreamsies or Assistant Team Leader FootedPanda on Xbox Live. 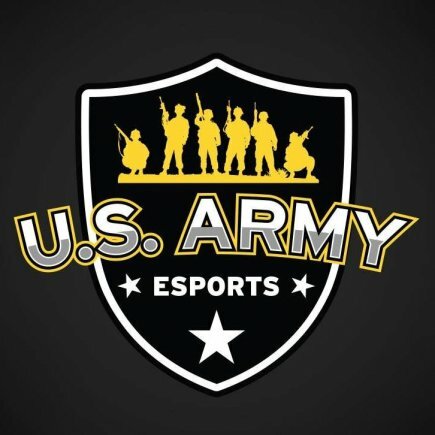 For more information about U.S. Army Esports, please reach out through Facebook, Twitter, Instagram, Twitch, and Discord. Next Saturday, March 30, ATOMICJORGE will celebrate hitting the monumental 200,000 subscriber milestone on YouTube by hosting a special 24-hour livestream. 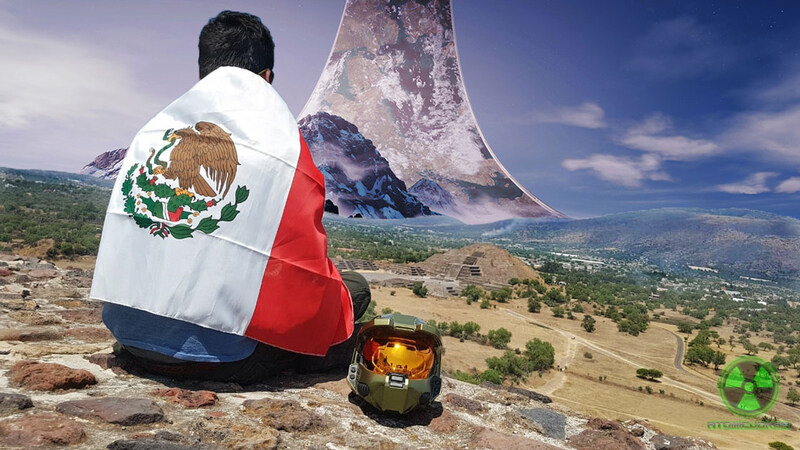 He'll be hosting a panel with special guests of the Mexican and LATAM games industry, holding lots of giveaways, and playing plenty of Halo. He's also promised quite the party, so don't miss the festivities on youtube.com/ATOMICJORGE and mixer.com/ATOMICJORGE at 12pm CST! March 14 Community Spotlight: Snickerdoodle's latest Community Spotlight was published while I was out of town for SXSW, but it's definitely one of my favorites. It features community creations surrounding our MCC on PC announcement and includes plenty of pizza. Investigating Halo 5 Server Issues: We've been keeping a close eye on increasing player reports of server issues with Halo 5: Guardians. After some initial investigating, we were able to identify a datacenter in the North Central US that was causing players to experience hitches/warping and have temporary disabled it. If you think this may have been or is currently impacting you, let us know in this H5 Support Forum thread. 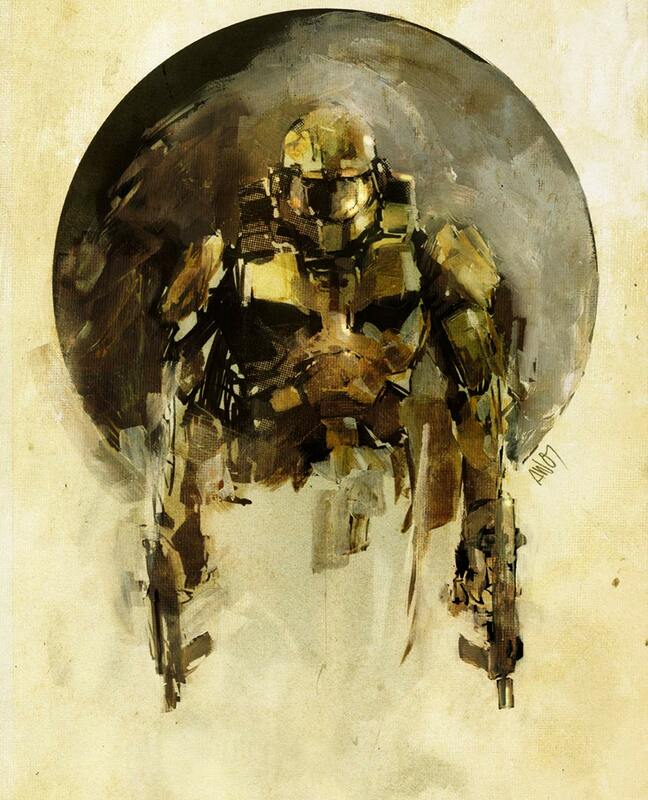 Ashley Wood's stylized art is some of my favorite from the franchise. I'm sure plenty of you remember this style of poster with Master Chief and Arbiter included in your Halo 3 game case on the back of the controller scheme. Although I love that one from my game case, ever since I spotted this other piece I've started to favor it more. 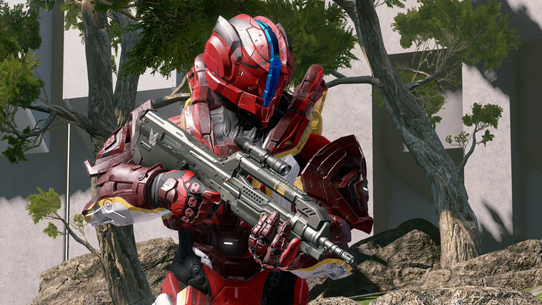 It's so simple – Chief rockin' duel SMGs. Here are some versions you can rock and share around the web! As always, I hope you enjoy! Thanks for joining me for another Community Update!